The Pelican was sold in kit form by Ultravia in 1984. 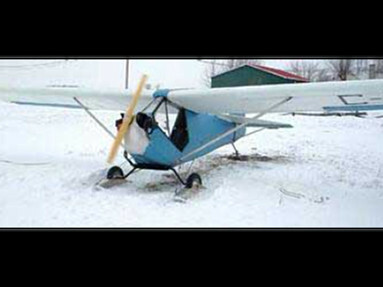 It is an aircraft of traditionnal configuration with a taildragger landing gear and steerable tailwheel. The photo above shows the aircraft with the original Global engine fitted with a an aluminum cowling. The fuselage and tail unit are built with aluminum tubes covered with doped fabric. The wing structure consists of an aluminum D-cell spar on which the styrofoam ribs are mounted. The wings are also covered with doped fabric. Wings are hung to the fuselage with a single strut. All these characteristics combine to give an aerodynamically clean wing with an exceptional 12-to-1 glide ratio.